No more bees mean no more pollination, no more plants, no more animals, no more man. According to new research published in the journal Science, changing temperature and weather conditions due to climate change has restricted the area where bees can survive. On the top of this, heavy use of pesticides, disease and habitat loss are other bad news for bees. The landmark study adds to scientists’ understanding of how different species respond to climate change. Many animals—like the butterfly—have adjusted to a changing climate by migrating towards the Earth’s poles. But the research on bees suggests that not all species have the same ability to adjust. Though bees can easily move from location to location, researchers suggested the migration may not have occurred because bees have trouble setting up a home in a new place. The study, which evaluated land use changes and pesticide application in addition to weather conditions, attributed the drop to climate change. To address the impact of climate change on bees in Meghalaya, northeast India, Iba Blah started the Blossom Honey Project as her social venture back in December 2015, with 10 bee boxes, only to discover that beekeeping isn’t exactly a cakewalk. But to give up is not in Iba’s dictionary. Her tenacity, passion, and unwavering desire for success keep her moving forward. Even though Iba hasn’t harvested so much as a spoonful of her own honey, she sells bottles of her “Blossom Honey” brand as her pointing strategy. She is working on establishing brand visibility first; she aggregates procurement from other farmers, to position her brand. She does it professionally, conforming to regulations. Finance –10 colonies are too small. 50 colonies would make her at least a ‘medium-sized’ producer, a more viable option. She wants to introduce Italian bees, Apis mellifora, which yield about 35 kgs per annum per colony. The Indian bees, Apis cerana indica that she presently rears, yield only about 6 kgs per year per colony. But all this requires financial investment and governmental assistance/subsidies, which are painfully slow. Swarming and Absconding – two main behaviors of the bees: (a) They swarm – move to form another colony, due to overcrowding; and (b) they abscond – they leave the colony due to factors like lack of food, enemies, disease etc. Both are headaches for the beekeeper. Labor – Meticulous care is essential, as bees are very sensitive to their environment. Obtaining competent for this is difficult. Iba states that honey can be paired, infused, cooked, and brushed with almost every creation in the kitchen. Honey tastes as good by itself as it does in salads, dips etc. and one cannot discount the magic of honey. The highest producers of honey in India are Punjab and West Bengal. The best honey is said to come from Himachal Pradesh and Haryana, but Iba believes that the northeast with its vast natural flora, which she is trying to protect, brings the best organic honey. 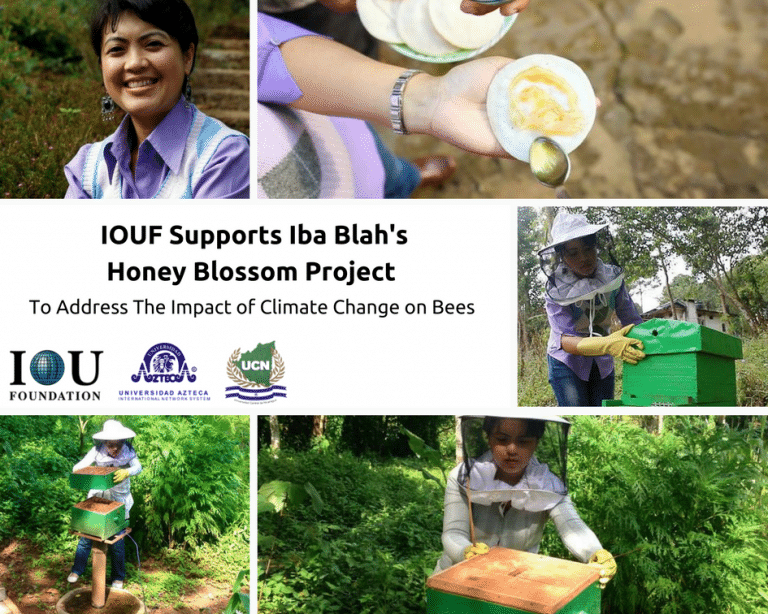 Iba is very grateful for the support from IOUF that is making her dream to fight for the bees a reality. With the grant from IUOF, Iba will be able to obtain more scientific bee boxes before procuring the queen bee and colony. She will also acquire a honey extractor with glass jars and aluminium foils to store her blossom honey. IOU Foundation is proud to support Iba in her initiatives and wishes her the best in her future endeavors.